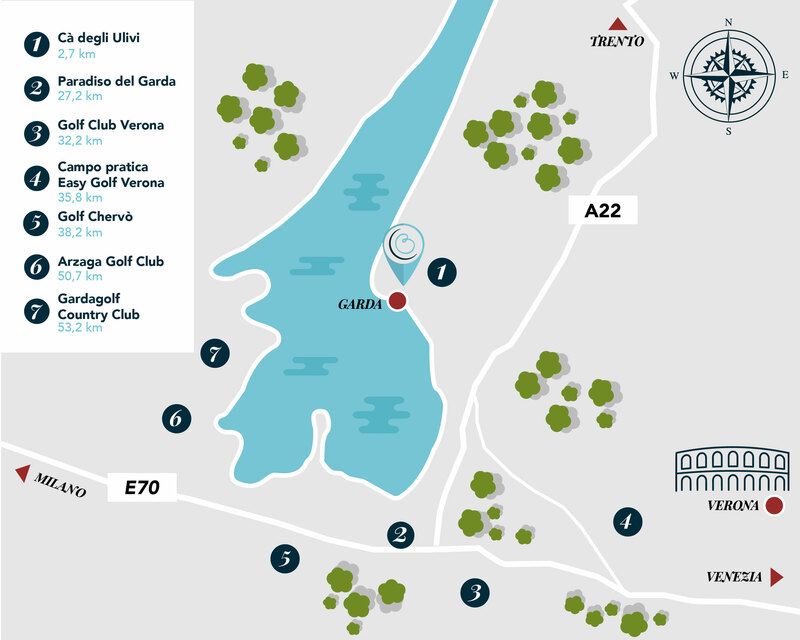 GOLF CLUB CA' DEGLI ULIVI The relatively mild climate of Lake Garda allows you to play all year round and, during the warmer months, the Lake breeze also mitigates the hotter temperatures. The Golf Academy with driving range is enriched with putting green and an approach green and the 9 hole Mirabello course. PARADISO DEL GARDA Golf Club Paradiso del Garda is a modern design course, designed by the well-known American architect, Jim Fazio. It is open all year round and is equipped with 18 championship holes, featuring technical characteristics that can satisfy even the more demanding play. GOLF CLUB VERONA This lies between the vineyards that to the west of Verona enclose the hills of Custoza, distinguished by a hilly course with slopes only at challenging stretches. The first nine holes are narrower and shorter; whereas, the second ones are very long but also larger. GARDA GOLF Experts consider Gardagolf Country Club as one of the best courses built in the last thirty years. Set on an area of 110 hectares, designed by British architects, Gardagolf Country Club includes 27 championship holes between Rocca di Manerba, the Soiano Castle and the hills of Valtenesi, with extraordinarily beautiful panoramic views. ARZAGA GOLF CLUB Two unique paths for a total of 27 holes, designed by two golf legends and a scenic practice course of rare beauty. GOLF CHERVO' Designed by architect Kurt Rossknecht, the golf course has 36 holes, of which 27 championship holes, divided into three courses, Benaco, Solferino, San Martino and 9 executive courses. CAMPO PRATICA EASY GOLF VERONA An attraction spot for all golfers in the city, who consider Easy to be the ideal environment to learn and improve their golf. The best way to explore the diverse and varied landscape of Lake Garda is without a doubt on two wheels! The safe cycling trails bordering the Lake and which penetrate the neighbouring area are perfect for cyclists of all ages! Lake Garda offers different types of routes, really suitable for everyone: beginners, children, and bikers, but also experienced cyclists. Let’s put the sails up and set sail on an unforgettable trip on Lake Garda. A day of fun, relaxation and adventure, discovering the hidden corners of one of the most beautiful lakes in Italy, led by an experienced skipper. Garda has a long and consolidated sailing tradition and in the last fifty years its Clubs have been able to create the best Olympic class skippers. Wind conditions vary according to the area: light air at the bottom, cooler winds in the north of Gargnano towards Malcesine, Riva and Torbole. The Gardesan competitions, such as the Centomiglia and the Intervela are very famous regattas with a history of fifty years. Thanks to the constancy of the winds, Lake Garda is one of the best known places in Europe and the world. This is because the two main winds change intensity depending on the location. It means that each of you can find the ideal conditions depending on the level and discipline. Important competitions and numerous championships are organised especially in the high lake. And in this area there are several Circles reserved for solo surfers. Alpine atmospheres and Mediterranean flavours. These are two characteristics that are so diverse that they make Lake Garda a unique place for all outdoor activities. You can choose routes that offer stunning views of Lake Garda, such as Mount Baldo, or the Emperor's Fortress Trekking, routes dedicated to the historical memory of the First World War. Lake Garda is recognised at European level as the paradise for sport climbing. This fame is surely due to the hundreds of paths of every level of difficulty; from beginner to expert, here everyone can find the wall that best suits their characteristics. Summer is undoubtedly the favourite season for climbers, but Lake Garda, thanks to its mild climate, allows climbing throughout the year. The walls are perfectly equipped and allow you to climb safely. The mild climate and the wonderful views that offer trails immersed in the woods and amidst the mountains are just some of the pleasurable aspects of a ride on Lake Garda. Even those who want to learn how to ride a horse or improve their technique can find specialised centres here, where to take lessons and learn to ride on horseback while having fun. From Mount Baldo to Malcesine, flying over Lake Garda. A unique emotion in total safety, an experienced professional pilot will accompany you for a walk in the sky which you will preciously remember.